Did you know that breast cancer is the most common cancer in the UK, with over 50,000 individuals diagnosed per year? Although treatments are improving and fatality rates are decreasing, there is still no cure for the disease. 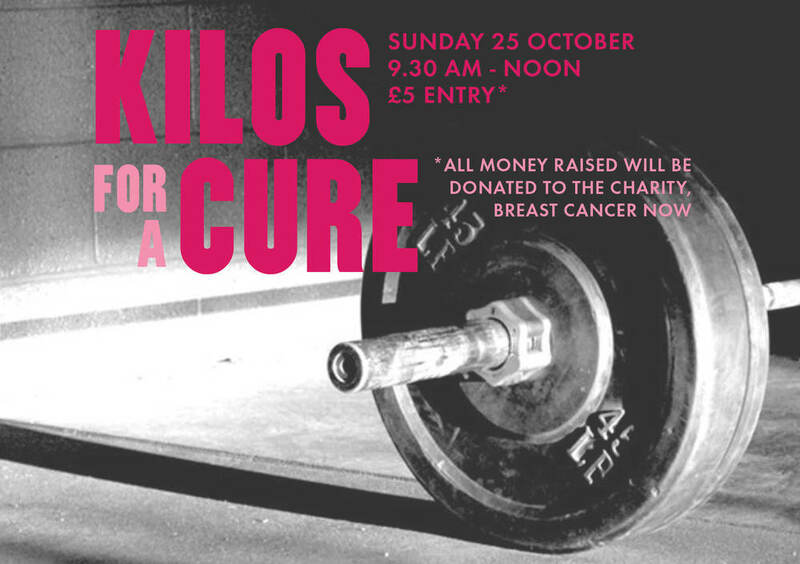 So, we want you to contribute your efforts to support the efforts of others with Kilos for a Cure, a special WOD to raise money for the charity, Breast Cancer Now. The event will take place on Sunday 25 October from 9.30 am - noon. We will be doing "Grace" (30 clean & jerks for time) and we'll also have a 1 RM clean & jerk competition, with prizes given out to the fastest "Grace" times for men and women in beginner, intermediate and advanced categories, the top 1 RM, and Best Dressed Athlete (think pink!). The cost of the event is £5 to participate and all money will be donated to Breast Cancer Now. Get involved on our Facebook event page, and keep an eye on our blog for more details and updates. Look forward to seeing everyone there! Older Post21 Sept 2015 – You've got the Gunz, but what about the Gumption? ?